At Thomas Family Dentistry, we offer excellent pediatric and family dentistry treatments to people near Winchester, VA. 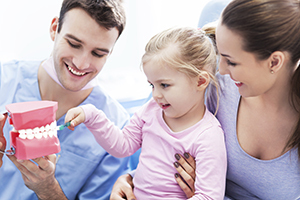 When you visit our office, we promise that you will receive the best pediatric and family dental work. No matter your age, our friendly staff is dedicated to making all patients feel relaxed and secure during their dental appointment. As a comprehensive family dental clinic, we provide all the normal procedures of a general dentist like cleanings, check-ups, root canal therapy and tooth fillings. For the most professional family dental services near Winchester, VA, make an appointment at Thomas Family Dentistry. Our experienced dentists work deliberately with our caring, considerate staff of dental technicians to make your visit as easy and painless as possible. Emergency dentistry is essential if you are undergoing intense pain or have been injured. If you have a tooth knocked out or pushed into the jawbone, or if a tooth has been pushed out of normal alignment, you should call us right away. Emergency dental services are most positive if accomplished as soon as possible. You may need to have your teeth extracted in certain circumstances for the benefit of your oral and overall health. These circumstances include tooth pulp infection, infection risk, crowding, an impacted tooth or gum disease. When you are missing a tooth but want to dodge dental bridges, consider dental implants. These use titanium to fuse directly to the jaw bone. These implants are known to be a lasting fix. You might need dental restoration in the way of cavity filling, crown placement, bridges, and root canals extractions. We also offer curative implants and veneers. The experienced Thomas Family Dentistry staff is great with children and is committed to making brushing and flossing fun for them. We give special attention to protective care, along with performing comprehensive oral health assessments, evaluating orthodontic issues, outlining tooth and jaw development, and administering topical fluoride and sealants. These can become critical when you have an abscess, tooth pain from heat or cold, unbearable tooth pain, tenderness and irritation or sensitivity that causes strain when eating or speaking. During these techniques, we will take out pulp, nerves, bacteria and decay and then fill the space with antiseptic dental materials. Often, without this procedure, tooth removal would be necessary. This procedure is often a long-lasting solution. This includes six-month inspections, teeth polishing and radiographs and, if required, periodontal cleanings and examinations of tooth decay and renewals, oral cancer scanning, and oral hygiene recommendations. If you need a new family dentist near Winchester, we're here to help! Contact the dental office of Thomas Family Dentistry a provider of general and restorative dental services for the whole family. Visit our website today.